He was a friend to the poor . 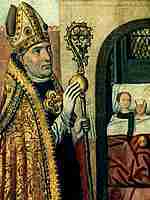 He became a bishop and continued helping people all his life. He is the subject of many legends. 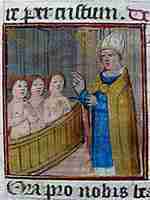 who had been chopped up and put in salt by a butcher. 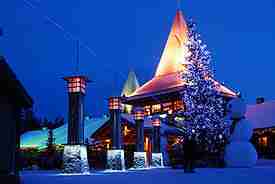 on the Arctic Circle in Santa Claus' village near Rovaniemi (north of Finland). There he makes toys for children with the help of the elves. flying reindeer. Rudolph, the red-nosed reindeer, is the leader of the team. the parcels in front of the fire-place or under the Christmas Tree. lights, tinsel and there is often a star on the top. 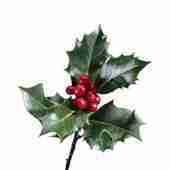 Holly and mistletoe are also traditional Christmas decorations. it is marvellous to see their eyes full of joy and amazement. 1. In England Santa Claus is also known as Asia Minor Christmas eve Father Christmas a sleigh down the chimney elves flying reindeer holly mistletoe red I don't know . 2. Santa Claus' little helpers and toy makers are called Asia Minor Christmas eve Father Christmas a sleigh down the chimney elves flying reindeer holly mistletoe red I don't know . 4. Santa's means of transportation is powered by Asia Minor Christmas eve Father Christmas a sleigh down the chimney elves flying reindeer holly mistletoe red I don't know . 7. Which day does he deliver the gifts? on Asia Minor Christmas eve Father Christmas a sleigh down the chimney elves flying reindeer holly mistletoe red I don't know . 10. The original Santa Claus, St. Nicholas, was born in Asia Minor Christmas eve Father Christmas a sleigh down the chimney elves flying reindeer holly mistletoe red I don't know .